The view of the Center City skyline from R2L. 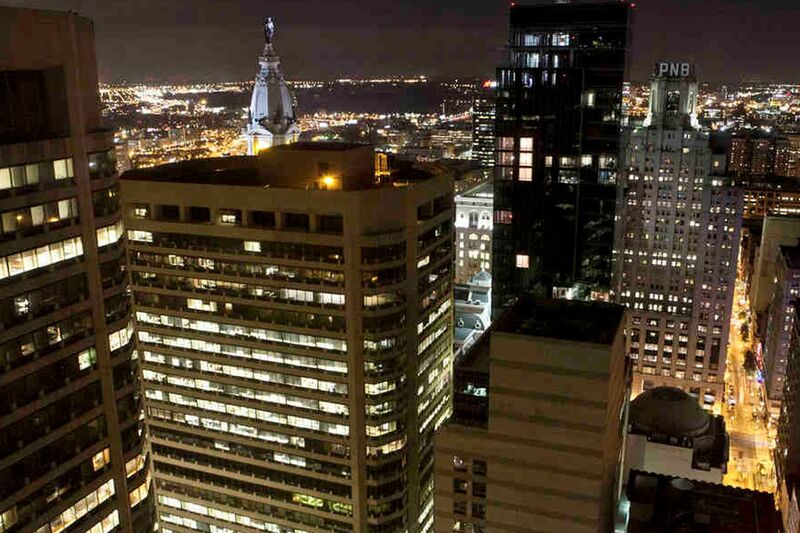 Philadelphia now ranks second only to Midtown Manhattan when it comes to people who live in the heart of the city. For years, the change has been visible at eye level: rowhouse and industrial neighborhoods south and north of Center City bulging with newcomers settling into once-forlorn pockets a bus ride away from City Hall. On Monday, the scope of that reinvigorating shift of reinvestment was made evident in numbers. A 7.7-square-mile section of central Philadelphia extending to South Philadelphia and Fishtown has grown so much over the last 15 years that now ranks second only to Midtown Manhattan when it comes to people living in the heart of a city. The Center City District, which released its annual report Monday, defined the area of extreme growth as bordered by Girard Avenue and Tasker Street. Since 2000, population grew 16 percent in the district that is also bounded by the Schuylkill and Delaware River, bringing the population to 183,240, the business-improvement district reported. Although the area prominently highlighted in the CCD's annual report is far larger than the district's long-standing locus radiating from City Hall, chief executive Paul Levy made it a major part of this year's survey because of what it illustrates about the city's renaissance. "From the 1960s to the 1980s, people avoided living downtown nearly everywhere across the U.S.," Levy said. "New York City was always an exception. So it is a way to benchmark Philadelphia's progress." The report reiterated much of what other data have already shown: An influx of young professionals and empty nesters is fueling a residential construction boom that began years ago but is continuing with considerable force. And those people are happy to be where they are. In a survey last fall of 2,700 people, 88 percent told the CCD they thought Center City was headed in the right direction - up from 81 percent the year before. But the report also sounded a different refrain: Center City's job market remains troublingly weak, and underfunded public schools are the other major challenge confronting anyone hoping for sustainable trends. Since 1990, Philadelphia has lost 6.8 percent of private wage and salary jobs, while the suburban counties, and other Northeastern cities, have added jobs, the report said. "The news in Center City is very good," Levy said, unveiling his staff's findings at the CCD's office at Seventh and Chestnut Streets. "It could be that much better." The jobs picture is not nearly as rosy as that of residential construction. Even as onetime skyscrapers have been converted into homes, office rents have been relatively weak, the CCD noted. "Due to anemic office job growth, Center City's average rent per square foot of $27 is well below those of East Coast peers Midtown Manhattan's ($75), Washington, D.C.'s ($51), and Boston's ($47)," the report's authors wrote. Similarly, the dearth of corporate headquarters in Philadelphia seems to be holding down prices for hotel rooms, despite the fact that occupancy hit a record high of 75.5 percent last year, the report found. "The absence of strong business demand is a missing driver for hotel rooms," Levy said. Core Center City was ultracompetitive, however, in terms of how easy it is to walk and bicycle through. Center City's combined walk and ride scores - a measure tabulated for the CCD by a third party - placed it ahead of Midtown Manhattan and the downtowns of Boston, Chicago, San Francisco and Washington. Beyond the core, the Greater Center City area - as CCD dubbed the expanded central area - continued its brisk pace of redevelopment. Last year, developers completed 1,983 residential units there, a slight dip from 2013. But this area did not just add residents. It added residents with considerable educational credentials. When his researchers analyzed the numbers, Levy said he was thrilled to see such high education levels of people in the expanded area. Fifty-seven percent of people 25 and older in Greater Center City hold a bachelor's degree or more. In Philadelphia overall, that level is 47 percent. In core Center City, the figure is 76 percent. Levy said he intended to press for tax policies more favorable to job creation in the years ahead. Businesses could tap the educated workforce - assuming tax policies are improved before those new residents move back out of the city. "The sooner Philadelphia chooses the path of competitive tax policies, the sooner opportunities expand for all city residents," the report said.